Welcome to the Karoo Hoogland Municipality website. Here you will find all the information you need about the municipality and tourism in the area. We hope you will find this online service helpful and easy to use. Do not hesitate to send any questions, complaints or comments to us. You can contact us for help by sending an e-mail to karooadmin@karoohoogland.gov.za, or by completing our online contact form. 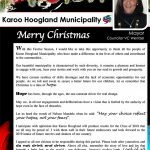 We welcome any feedback and input about municipal aspects of Karoo Hoogland Municipality.